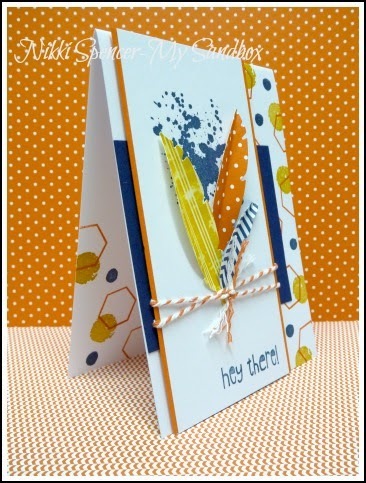 Hey there!.....It's that time of the week where we share our new Just Add Ink challenge and Kim has created a great sketch for this week. 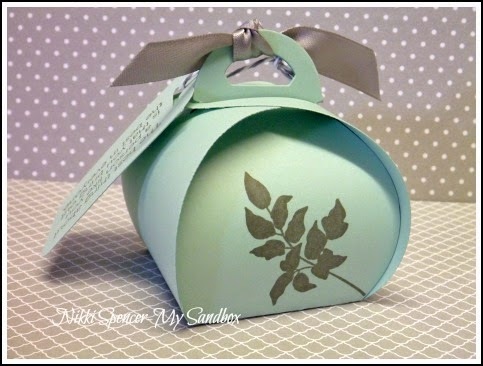 I love the simple lines and kept my project simple in design as well. 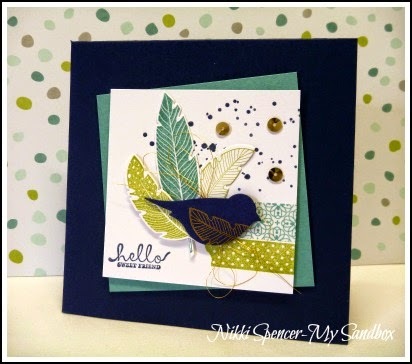 I used the "Hello Love" hostess set with "Kinda Eclectic", l think they work well together and that little bird is just the cutest! 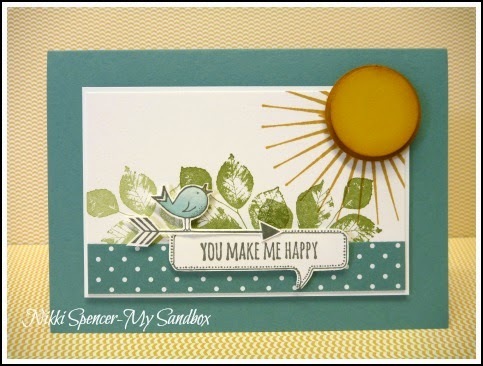 I combined Hello Honey, Lost Lagoon & Pear Pizzazz for this one! 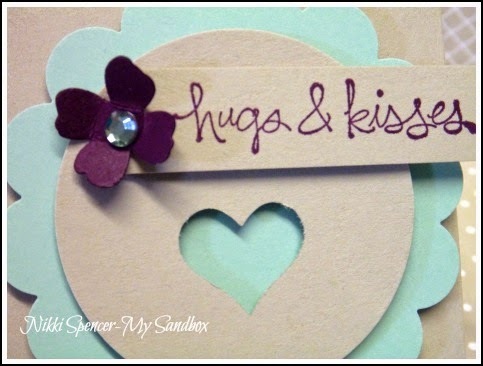 The design team have created some lovely inspiration to help get you started. 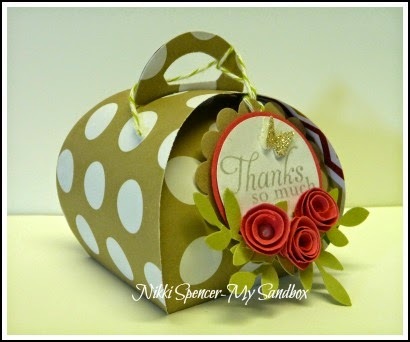 Punch Board Box with Lid! 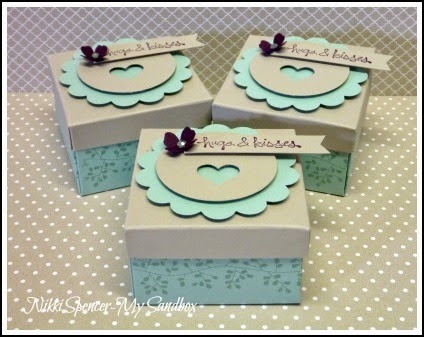 I'm back to share another cute little box with you! 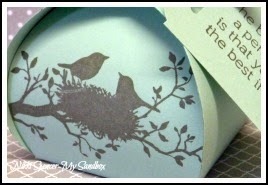 These were made on the Envelope Punch Board and are very quick & simple. The base is 6"x 6" Soft Sky Punched & Scored @ the 2" mark on all sides, then l lined up the score lines on the EPB little arm/tab and punched and scored on all sides again..Done! You can see in the 3rd pic, that l haven't cut or glued the box, l decided it's easy to store flat that way and as there was nothing holding it together, l created a lid for easy opening. 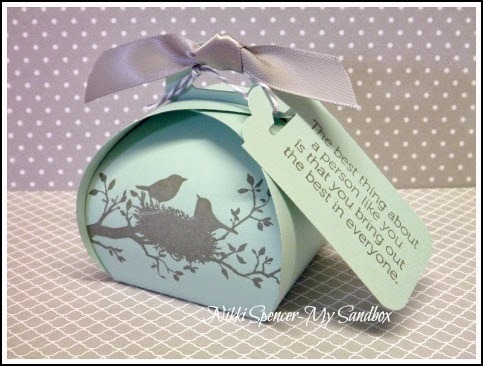 The lid dimensions are...3-3/8" x 3-3/8" Sahara Sand cardstock. Scored @ 1/2" on all sides to create a 2-3/8" lid. I then snipped one of the corner scores on all sides to create the flaps, that l then taped inside. 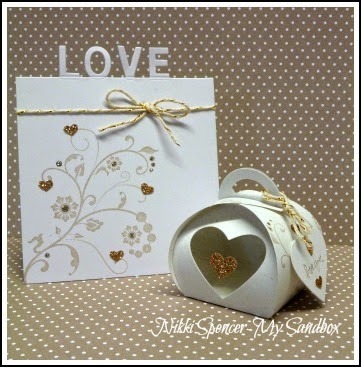 Curvy Keepsake in Polka Dots..
Yep! 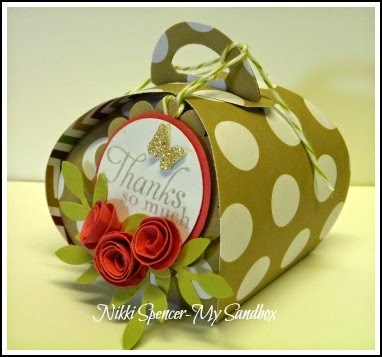 it's another "Curvy Keepsake" creation...:0) This one uses a retired DSP stack from SU and although it doesn't cut the whole box, due to the dsp width, it only misses a triangle section from each base, so no biggie really..:0) It still goes together perfectly, you just need to tape in a slightly different place. 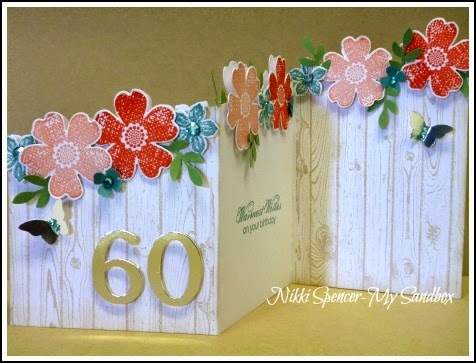 Good Morning!....Today's share is a card l made a few weeks back for a friends birthday. 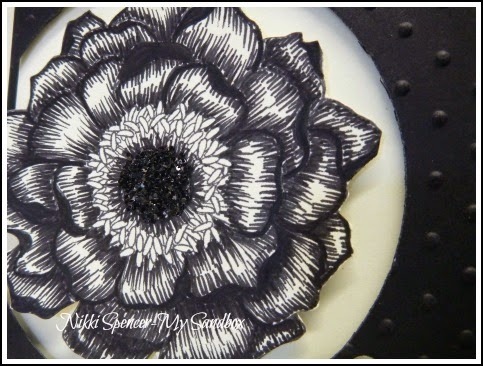 It uses the "Blended Bloom" stamp, Staz-on Black and the fine tip of my Basic Black marker. 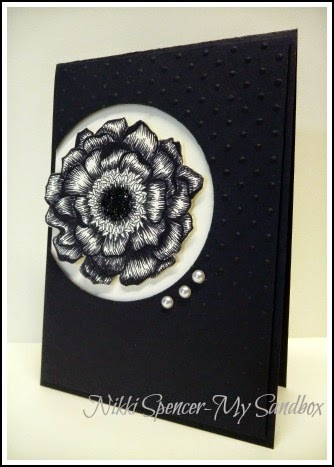 To add some definition in the center, l covered it with Crystal Effects and sprinkled some chunky black glitter over it. 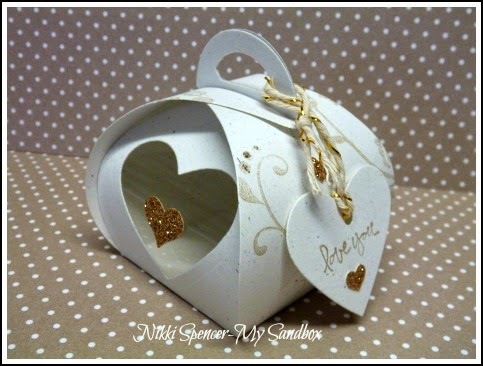 Good Morning!.....I thought l would pop in and share these little "Curvy Keepsake" boxes. 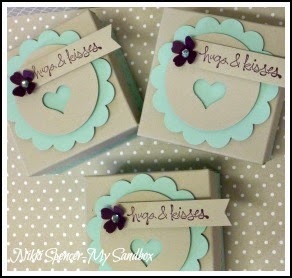 I'm in love!...They took no time to make and l love how sweet they are, in the combination of Soft Sky and Basic Grey. 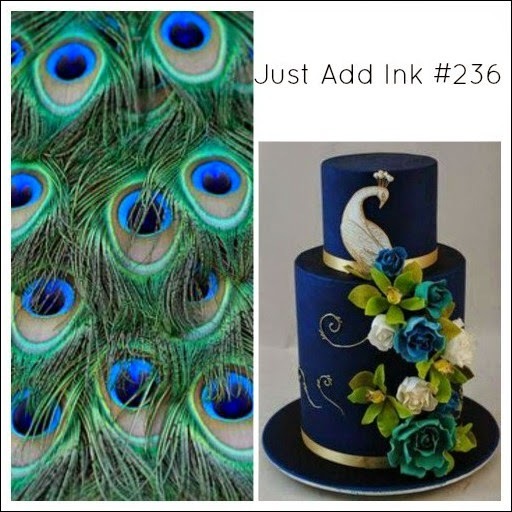 To decorate l used the "World of Dreams" stamp set. The silhouette images are just lovely. 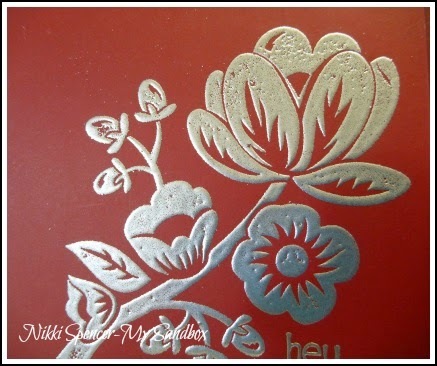 Just Add Ink # 237......Acrylic Block Stamping! 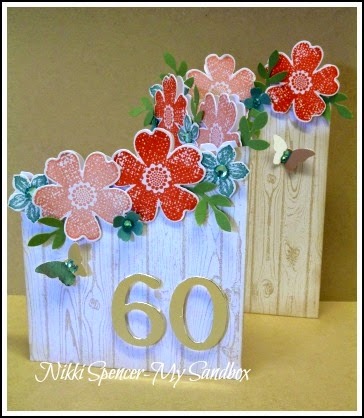 Happy Friday everyone!......Paula has challenged us to use "ACRYLIC BLOCK STAMPING" for this weeks Just Add Ink Challenge. 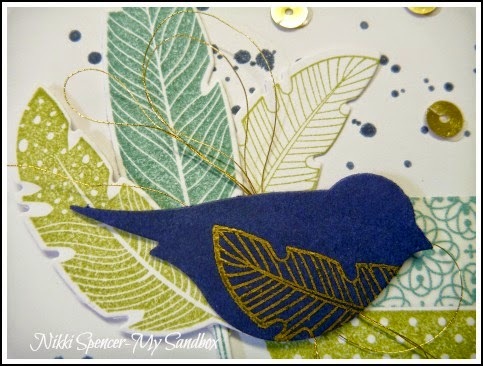 I had planned on doing something more involved, but as l started playing, that changed to literally inking, misting and stamping with an acrylic block...Simple! 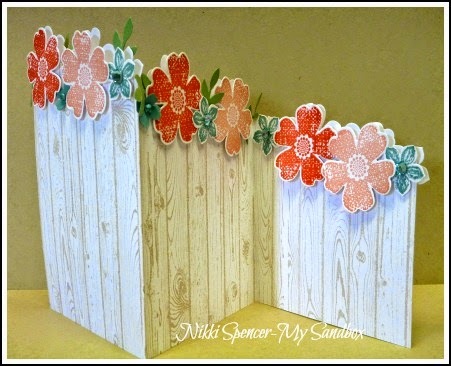 I used my SU markers in Bermuda Bay-Coastal Cabana & Pool Party to colour the block on the diagonal, misted it lightly with water and stamped. Once that was almost dry, l sprayed water into my palm and flicked it over, allowing it to wick out and create a motley effect. 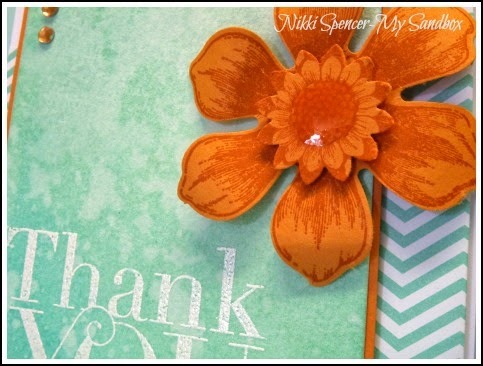 Don't forget to stop by the challenge blog and see the inspiration from the rest of the design team. 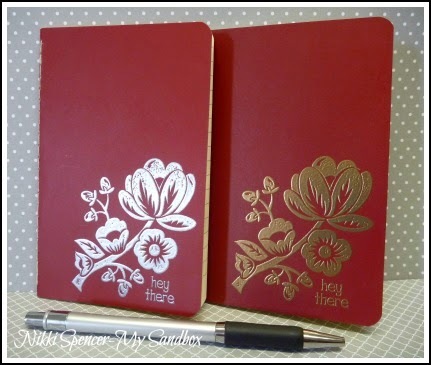 This stamp embosses beautifully, due to the lovely solid design and being a dark red, the gold and silver really standout...Pretty happy with these! 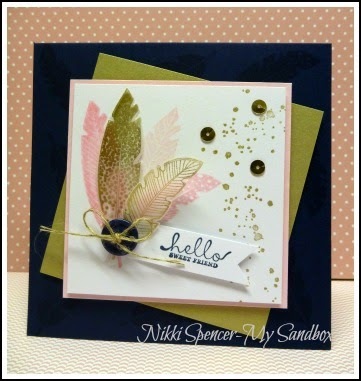 After making my card for the Just Add Ink challenge, l decided, while l had everything out still, l would have a play with a pink and gold version. 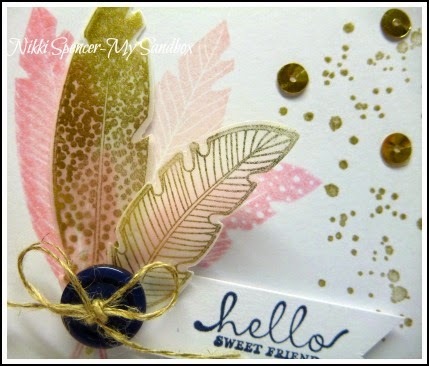 I stamped the feather images onto Vellum using Encore Gold ink and a couple onto the panel, using Pink Pirouette and Pretty in Pink in various strengths. 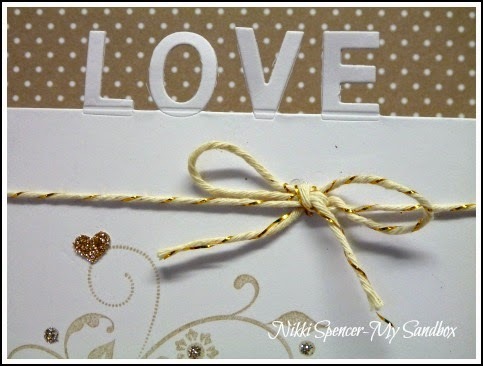 I love how well the brushed gold cardstock matches the Encore gold ink, both have a softer matt look. 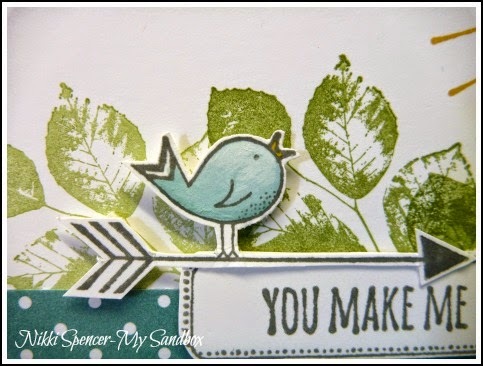 Hey there!....I've been having another play with the partial die cutting technique and thought it would be cute in a "Love & Heart" theme. 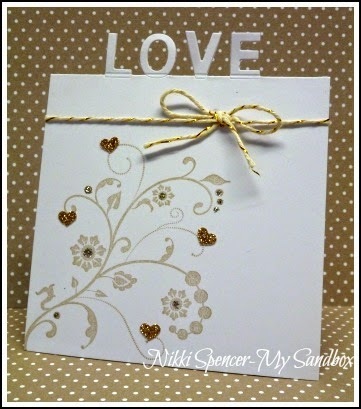 I used Naturals White cardstock, with Crumbcake and Champagne Shimmer Paper. 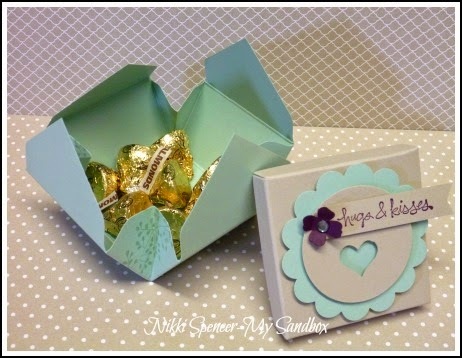 I also created a matching gift box, using the Curvy Keepsake die and the heart framelits with some window sheet. 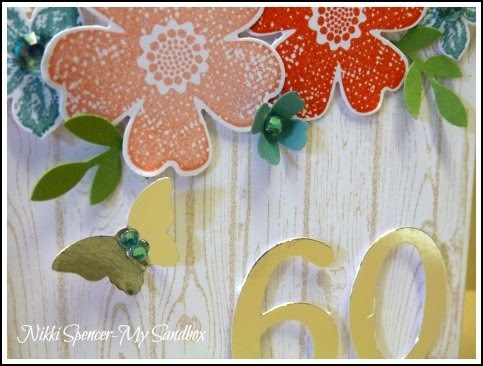 These colours are so vibrant and pretty and teamed with a hint of gold, they really are lovely together. 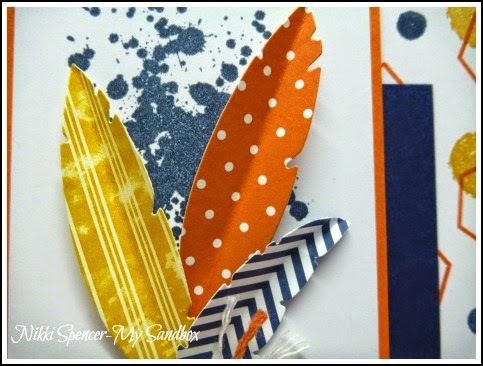 I'm enjoying adding Washi to my cards of late and l had colours that worked with the inspiration, plus l wanted to play with my "Four Feathers" bundle again, so it kind of evolved from there. Colourful is certainly an understatement for this one. I was in the mood for colours and patterns and this was the result. 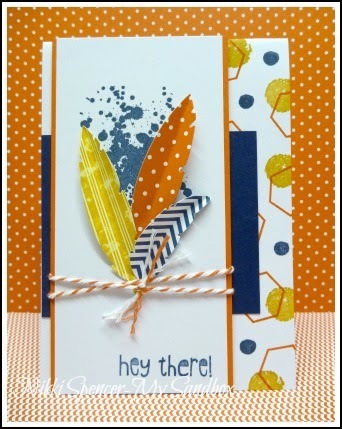 It started with wanting to have a play with the "Four Feathers" dies and dsp and l needed a card with a younger appeal...It's kinda bright & fun! Hey there!...I'm back to share the 3rd card in the "Black/Vanilla" combo. 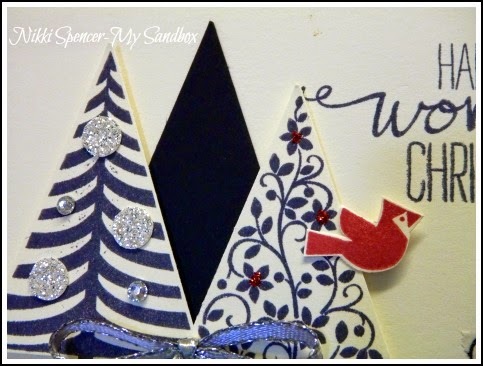 This one uses the very cute "Festival of Trees" bundle. 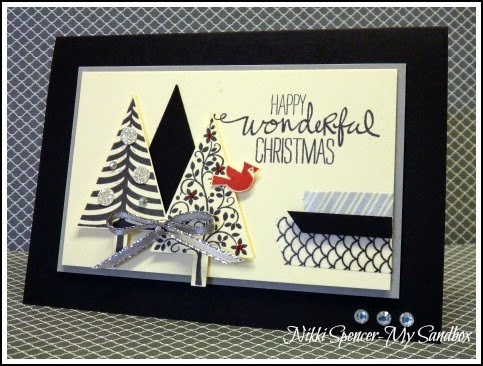 I came across This stunning card from Georgeann Manning and just had to case..:0) It's a perfect fit for the colours I've been using for Christmas. 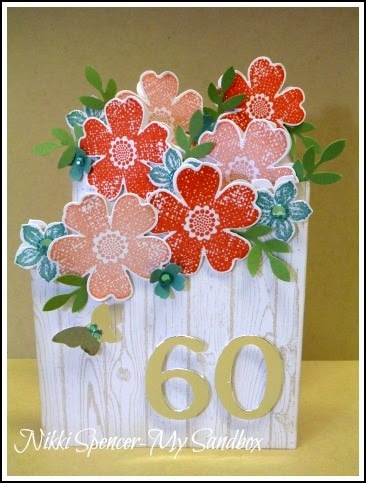 I added some Washi Tape, but pretty much cased her gorgeous card design, as is. I wanted to create something a little more detailed than my normal and incorporate some blue tones. 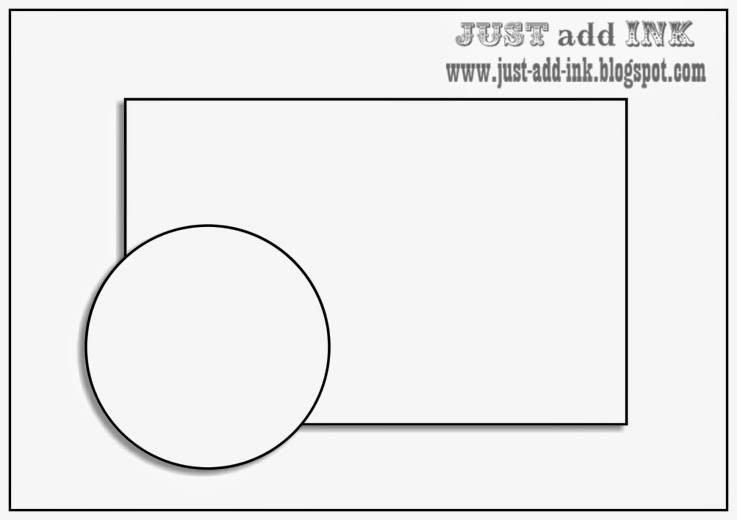 I started with a cardbase, cut on a diagonal, using the length of a piece of A4 cardstock. The measurements l used are 5-1/2" at the top & 3-1/2" at the bottom. I scored the A4 length @ 3-7/8" & 7-3/4" to create even panels. 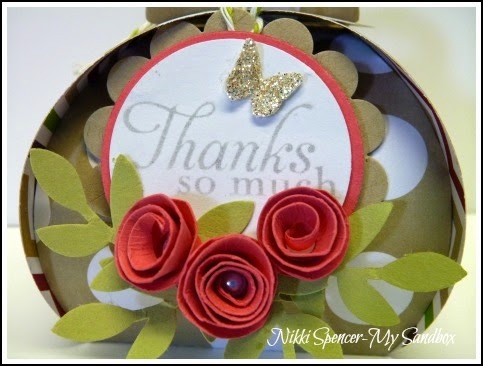 I used the current Hardwood background stamp on all but the inner center panel....You can see in the pics below that I've decorated both sides, as you need to do that for when it's folded. 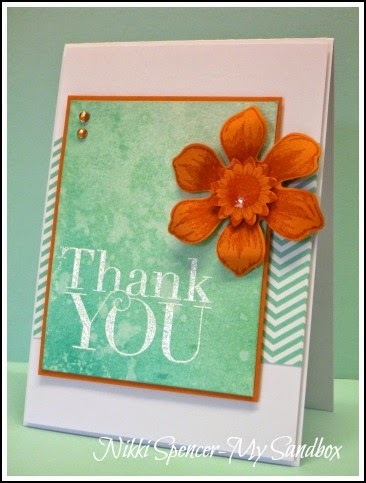 The colours l used are Calypso Coral-Crisp Cantaloupe-Crumbcake-Wild Wasabi & Lost Lagoon. I've coloured the rhinestones with Coastal Cabana Blendabilities.